In our regular monthly round up of Computer Science MOOCs we have options that will be of interest if you want to undertake a course of study rather than a one-off course. For those looking to gain a postgraduate qualification in Computer Science the news this month is that the application period for the Fall 2014 intake fpr Georgia Tech Online Masters of Science in Computer Science Online opened on March 3 and will close on May 11. Previously we'd reported that there would be two admission periods - one in March for Summer 2014 and a later one for the following semester but it seems that the Summer intake is already full. So don't delay if you hope to make a start on your online Master's in September. For those who don't want to do a full Masters degree but who do want a certified qualification Georgia Tech is also offering the flexibility to choose individual courses from the degree program to earn a Course Completion Certificate and Continuing Education Units (CEUs). Students who choose this option will receive the same instruction from Georgia Tech's faculty members and will complete the same coursework. If you just want the courseware and don't require University-issued certification all the courses developed by Georgia Tech professor for the OMS CS will be available from Udacity with Udacity projects in place of Georgia Tech exams and projects. These are self-paced and the first of of them are due to come on stream this May. Udacity still provides access to courses completely free but now offers an enrollment option, for which students pay a monthly subscription, for an enhanced experience. By enrolling in the class, you'll get project-planning advice and feedback on what you build to improve your portfolio. You'll also have a personal Coach throughout the course who will review your code, provide guidance on your project, answer questions about the class, and help keep you on track when you need it. After your final project review, you'll also go through an exit interview that Udacity will use to issue a verified certificate of accomplishment that is recognized by leading tech employers. The three Georgia Tech Masters in CS courses that have now been added to Udacity's course catalog are on machine learning - covering Supervised Learning, Unsupervised Learning and Reinforcement Learning respectively and are at Intermediate level. They join Sebastian Thrun's Artificial Intelligence for Robotics, which is already available from Udacity and is now an Advanced optional course in the OMS CS. An alternative form of postgraduate qualification is being offered on the edX platform. The recently announced MIT Professional Education MOOC on Big Data, which is the first in a series of Online X Programs has just started and its registration deadline has been extended unitl March 11. Tackling the Challenges of Big Data costs $495, has five modules covering 18 topic areas in 20 hours of video plus case studies and students who complete five assessments, designed to reinforce key learning concepts of each module, with an average of 80% will be awarded a certificate of completion. Coursera has also introduced new certificates - in its case earned by completing a series of linked course, see Coursera Offers CS Specialization Certificates. One of the first to launch is the Data Science Specialization aimed at those with some programming experience and a "working knowledge of mathematics up to algebra". Three of its nine 4-week courses, which together cover the concepts and tools needed throughout the entire data science pipeline, from asking the right kinds of questions to making inferences and publishing results. have a start date of April 7th - but you don't have to do them three at a time, although with a workload of 3-5 hours per week, doing more than one will be possible for some students. The initial course in the series has the title The Data Scientist's Toolbox and has two components. The first is a conceptual introduction to the ideas behind turning data into actionable knowledge. The second is a practical introduction to the tools that will be used in the program like version control, markdown, git, Github, R, and Rstudio. The other two courses starting at the same time are R Programming and Getting and Cleaning Data. An Introduction to Interactive Programming in Python, the first course in Coursera's Fundamentals of Computing Specialization comes on stream on March 24th. Lasting 9 weeks it has an estimated workload 7-10 hours per week and the other two courses in the series Principles of Computing and Algorithmic Thinking have their first presentations in June and August respectively and the series concludes with a "Capstone Exam" which "offers students the opportunity to demonstrate their mastery of the series material". As reported in our October MOOC RoundUp edX also issues certificates for successful completion of a series of linked courses. 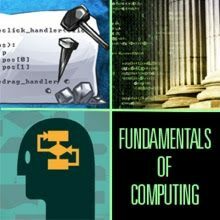 MIT's Department of Electrical Engineering and Computer Science and is a sequence of seven courses, each 8 weeks long and presented over successive semesters from Fall 2013 to Fall 2015 that introduce key concepts of computer science and computational thinking.